For several years now, the institutions of American democracy have been under increasing strain. Widening economic inequality, the persistence and increased virulence of racial and ethnic tensions, and the inability of existing political institutions to manage disputes and solve problems have all contributed to a growing sense of crisis in American democracy. This crisis of democracy extends well beyond immediate questions about elections, voting, and the exercise of political power in Washington. Our democratic challenges are deeper. How do we develop institutions and organizations to enable civic engagement beyond voting every few years? What kinds of institutions, organizations, and practices are needed to make public policies inclusive, equitable, and responsive to the communities they are supposed to serve? How do we create a greater capacity for and commitment to investing in grassroots democracy? How can we do all this while building a multiracial and multiethnic society inclusive of all? The current political moment creates an opportunity to think more deeply about both the crisis of American democracy today and about the democracy that we want—and how we might get there. Few scholars or practitioners would content themselves with our current democratic institutions. At the same time, generating a more durable, inclusive, and responsive democracy requires being realistic about constraints, limitations, and tensions that will necessarily arise. In this report we sketch out some of the central challenges and tensions we see, as well as some potential avenues for renewal and transformation. 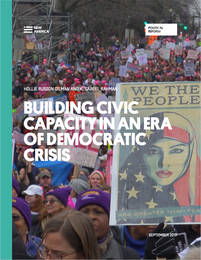 Based on a convening at New America in Washington, D.C. and a series of ongoing conversations with organizers, policymakers, and scholars from around the country, we propose a framework in this report to serve as a resource for continuing these important efforts in pioneering new forms of democratic governance. As a second part of this project, we published a capsule blog series featuring the stories of workshop participants as case studies. We're excited to share these original, curated stories from voices on the ground.